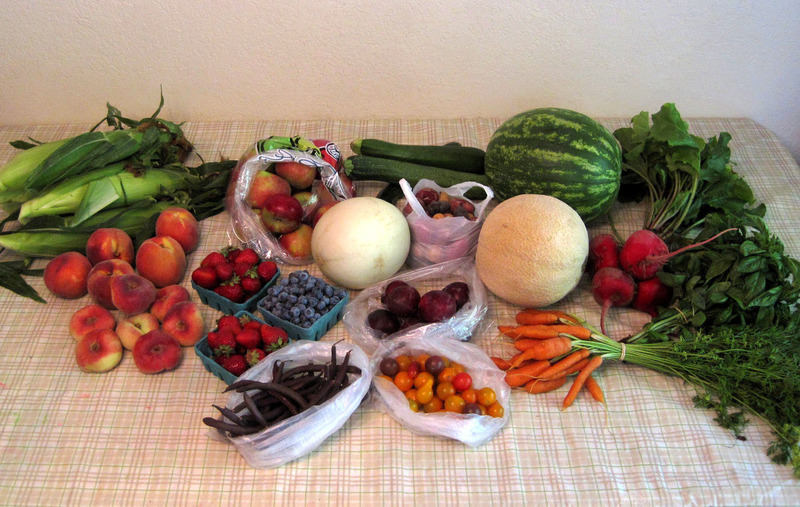 Escape from Obesity: Farmer's Market: What a Haul! Farmer's Market: What a Haul! Lots of food for my family for the coming week! We have already been eating the berries, peaches, and plums and I plan to have tomatoes with basil in a salad for lunch and tomorrow will make a roast with boiled fingerling potatoes and yellow beans from my neighbor's garden for dinner. I spent $52 on the food listed and pictured above. Excluding the basil, which cost $2 and weighs just a few ounces, there is 42 pounds of food on the table. So aside from the basil, I paid $50 for 42 pounds of food, which comes to $1.19/pound. I think that is pretty darn good for food that was all grown locally, much of it organic, almost all of it farmed without any pesticides or other sprays, and most of it picked yesterday. My family is much healthier for it! It makes me happy to see the kids chowing down on apples, plums, and carrots rather than processed junk. And now I am off to cut up that cantaloupe! Donut/Saturn peaches rank in my top five fruits. A LOVE their perfume and flavor and the shape makes them easier to eat than round peaches. So wonderful. Had one just now. Great haul. Healthy stuff is beeeeyoootiful, is it not? I just finished a 10 mi. run (a first for me) and decided to stop at my grocery store on the way back home. I also loaded up on lots of veggies and fruits, although not all were locally grown, unfortunately, but STILL--it does feel amazing to eat healthy, plus they're so pretty to look at and know they're about to nourish your body!! Nice haul, but spend that two bucks on a basil plant. It's incredibly easy to grow and very useful when cooking, esp when tomatoes are ripe! Awww, that looks amazing. I agree. That is a reasonable price for all that good food.it looks so yummy. Wow! I wish we had a good farmers market here!! What a great haul!! I'm salivating. Wow, you have one lucky family this week to be indulging in all that deliciousness! What a beautiful sight! And isn't it fun to just take your time and walk around the market just thinking about what you'll make? :) Yummy! That looks AWESOME!!! You are doing great selecting healthy stuff for you and your family!! !